BECAUSE many of the people you will meet here are MILITARY VETERANS, we have two sections just for them. These sites are under construction so please be patient! ...and his own favorite toys! 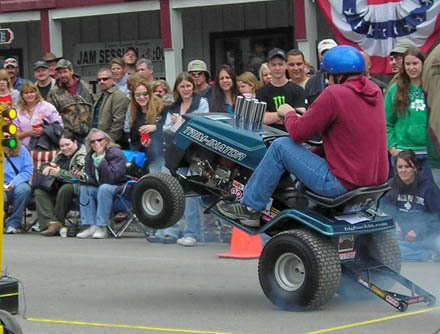 ...AND how to win at the LAWN MOWER DRAGS! ...or modify a push mower to impress the neighbors! TIM on THE TRIMINATOR burns up the pavement! TWIN ENGINES! FUNCTIONAL WHEELIE BARS! WOW! 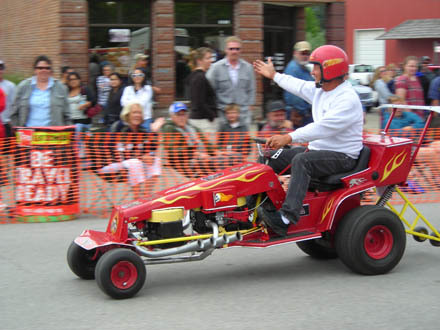 AND The MOWERTICIAN...for when you want to take that final ride to the cemetery...in mower racing style! KIMBERLY thrills the crowds! Smiling all the way! 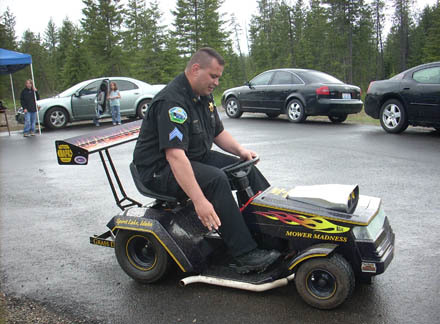 AND just in case you want to go speeding...DON'T!! COOL RIDES CAR SHOW is THE web site for your favorite motorized sports! 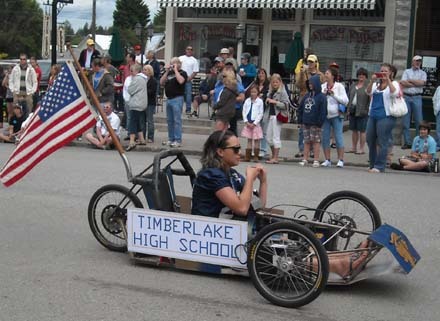 Timberlake High School's electric parade entry. Students designing tomorrow's machines...TODAY! Everyone gets involved! 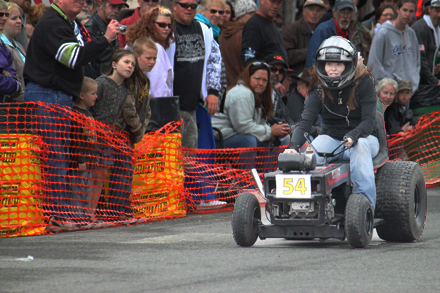 Besides, what better way to spend a day than at the MOWER DRAGS??? Besides the Lawn Mower Drag Races, we go to the Mud Bogs, the Combine Demolition Derby, the Ironman Competition, Car Shows galore, Military Events, civic parades, Boat Shows, Jet Boat Races, Remote Control vehicles events, Fishing Derbies...and more and more! And we never travel without a camera or two ready to shoot. So please, check out our website...and enjoy the lives and the sights my family has seen...all through the magic of our Digital Eyes. Get a pit pass to see the actual original blue prints! THEN watch that design burn down the track! Watch Richard's first ever racer smoke 'em! 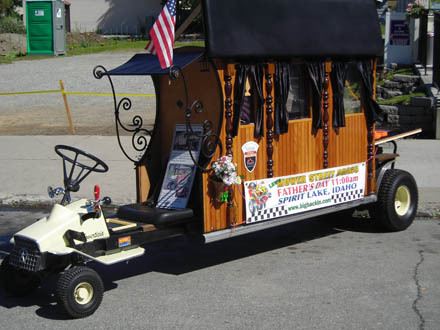 ...and admire a second cousin, a Vintage electric golf cart restored for the WORLD'S SMALLEST PARADE! BROWSE our photo gallery, and visit our other sites! See a 4x4 VW! ...and our section on VINTAGE TIN! And soon we will feature a gallery of Vietnam era warplanes too! Add us to your FAVORITES!